Rakusan did not include the Fan Series in his main sequence numbering. Therefore, the original number used for each of the 36 Series prints has been modified to identify the Fan Series members of its theme. The five different fan silhouette shapes have been here assigned arbitrary numbers 1 through 5. To indicate a fan design these shape designations are added to the 36 Series number separated by a hyphen. In themes which contain duplicated fan shapes, one has been arbitrarily designated A and the other B. 121-1A indicates that this is one of two Fan Series designs with fan shape 1 in the 121 Kumazasa Bamboo-grass and Pine theme. Like all other designs in this series, 121-1A was only produced in a single print run, and few copies are currently documented. The 121 Kumazasa Bamboo-grass and Pine theme has a complex history, and it has more individual prints than any other theme. 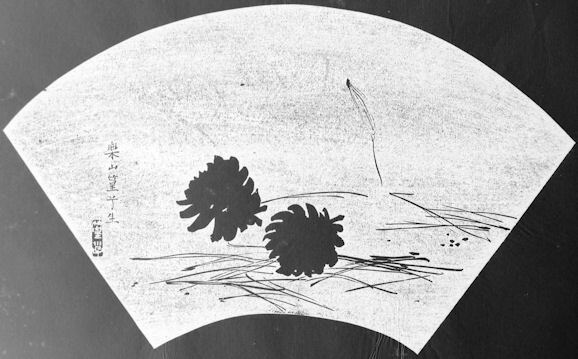 Rakusan had originally planned to have two separate themes, one for kumazasa bamboo-grass and one for pine. 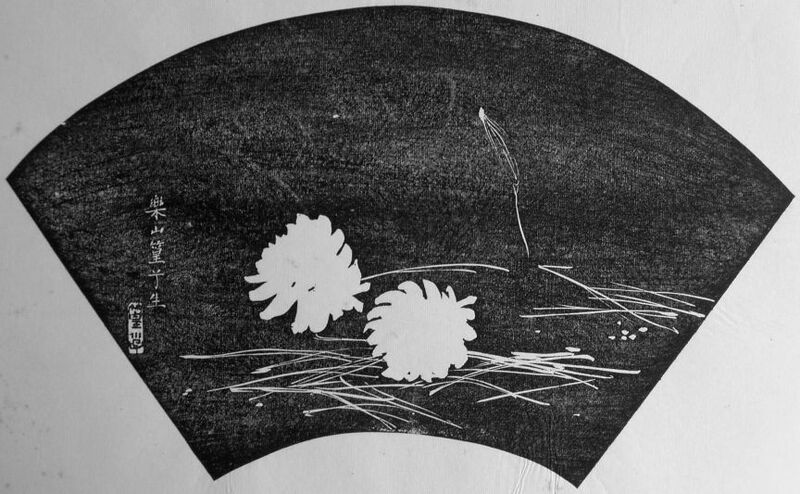 From the signature and seal markings, it appears that two of the pine fan designs may have been created as early as the end of 1933, and the other two pine designs (including 121-1A) and all four kumazasa bamboo-grass designs by early 1934. Then Rakusan set both incomplete groups aside for several months. Around the middle of 1934 Rakusan changed his original plan and combined the two as a single compound theme. He then painted 121-0 as the model for the 36 Series design 121 which included both original components.